Most of us have heard the stories of Ira Hayes, who helped raise the flag on Iwo Jima but died tragically at the age of 33, and George Herbert Walker Bush, whose plane was shot down off the island of Chichi Jima, but who survived to become president of the United States. There were five other Iwo Jima flag-raisers, and eight other pilots also shot down on their mission to bomb the communication towers on Chichi Jima. Author James Bradley knows their stories well. 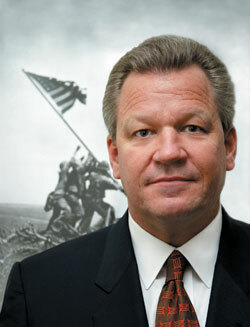 Bradley will speak at 11 a.m. Feb. 15 in the Lowman Student Center Theater. Bradley's first book was "Flags of Our Fathers," written in collaboration with journalist Ron Powers. It is about the six men who raised the flag, one of whom was Bradley's father. It achieved New York Times #1 bestseller status. "Senator John McCain warned me that I would never find a hero who admitted to being one," Bradley wrote in a Wall Street Journal Veteran's Day editorial. "I realized that the key to my dad's life was the attitude of common virtue he practiced throughout his days. My dad, running through bullets on Iwo Jima, doing his duty in the Pacific. My dad having the patience to teach me, a young son, how to tie his shoes. My dad, just lending a hand in his community." Bradley's second book was "Flyboys," a New York Times #2 bestseller. It is about the pilots who were shot down and captured on their mission over an island near the better known Iwo Jima. That book includes what one Associated Press writer called a "mention" of the one who was captured, survived, and became president. Bradley was praised by the AP reviewer for deftly mixing "his storytelling with historical insights and top-notch reporting to create a compelling tale that would have otherwise remained lost." "'Flyboys' is about the importance of the U.S. aerial might in defeating the Japanese, about the first war where air supremacy was the key to winning and losing. More specifically, though, Bradley writes about eight Flyboys--the young Americans who climbed inside planes during World War II--and the missions that left them prisoners of war on Chichi Jima. "It would be too simple to say 'Flyboys' is their story alone. Bradley provides sweeping historical perspective of the United States and its relationship with Japan, as well as insights into the Japanese military culture. And he paints vivid pictures of the war, much of it drawn from interviews with Japanese soldiers and citizens." James Bradley was raised in Wisconsin, studied at the University of Notre Dame, Sophia University in Tokyo, Japan and graduated with a degree in East Asian History from the University of Wisconsin. Before becoming an author he produced corporate films. Bradley's Web site says he "has traveled the world, living and working in more than 40 countries for nearly a decade. He has run companies in five countries. He has jumped out of airplanes at 15,000 feet, has scuba-dived in deep waters worldwide, trekked to Mount Everest's base camp and walked among lions in Africa. He is an avid reader of history, enjoys discovering exotic cuisine, cliff diving, golfing and snow skiing." The Web site, which contains a great amount of additional information, is at www.jamesbradley.com. Bradley is the latest of 29 Faculty Distinguished Lecturers to appear at Sam Houston State University since the series was started in 1980. They have included Ashley Montagu, Arthur M. Schlesinger, Jr., Zbigniew Brzezinski, John Kenneth Galbraith, David Halberstam, Liz Carpenter, Lech Walesa, George H. W. Bush and John Young.